Oh, my goodness! 12 mature sword ferns have been cleaned up, English Ivy removed, and put into the ground where they'll continue to thrive, hopefully. At least that's the goal. It's a good thing they are able to survive above ground for a bit, because I had to mull over a few of them to figure out where best to place them. In the end, I gave three away, kept the best looking ones, split a few others up, and one by one selected an optimal spot for them. 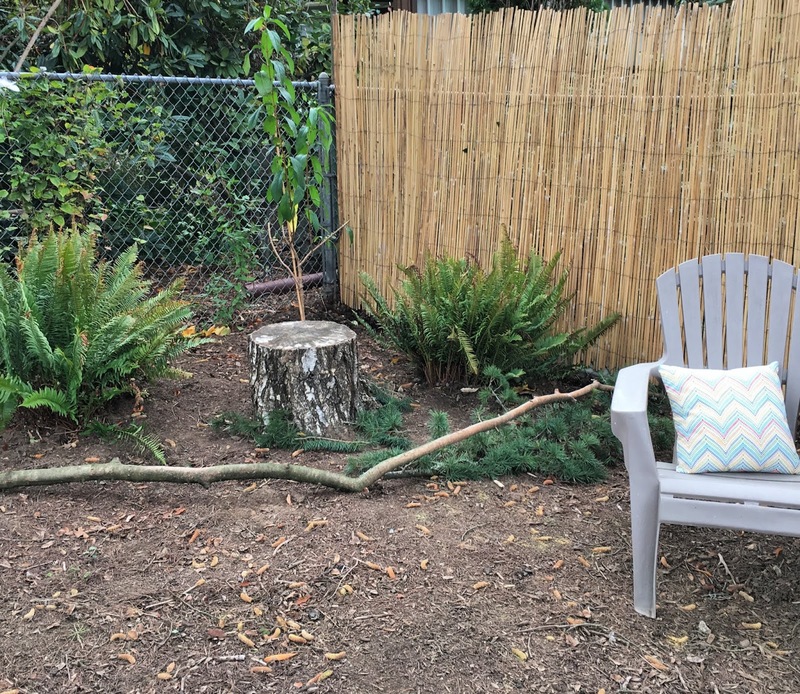 I have many native plants, such as evergreen huckleberry, red-flowering currant, and elderberry that will eventually be quite large. 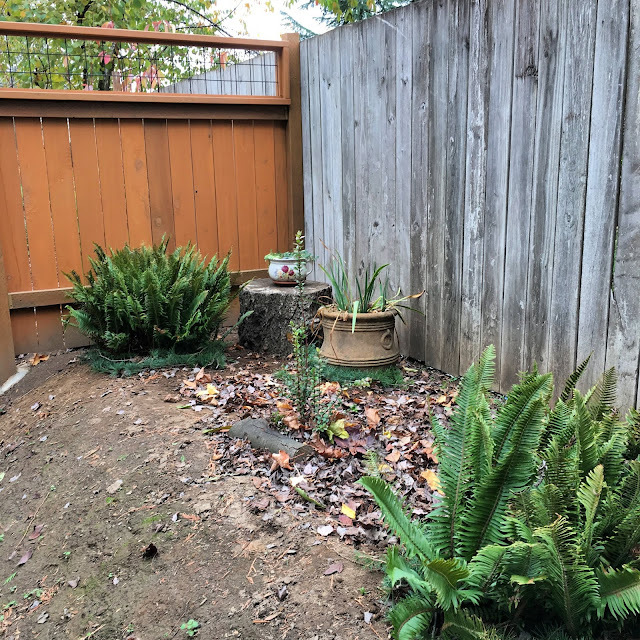 Keeping that in mind, I placed the sword ferns appropriately for the eventual growth of the larger shrubs to allow space for the understory and other canopy layers to thrive. The final two sword ferns I planted today were the one above and the one below. 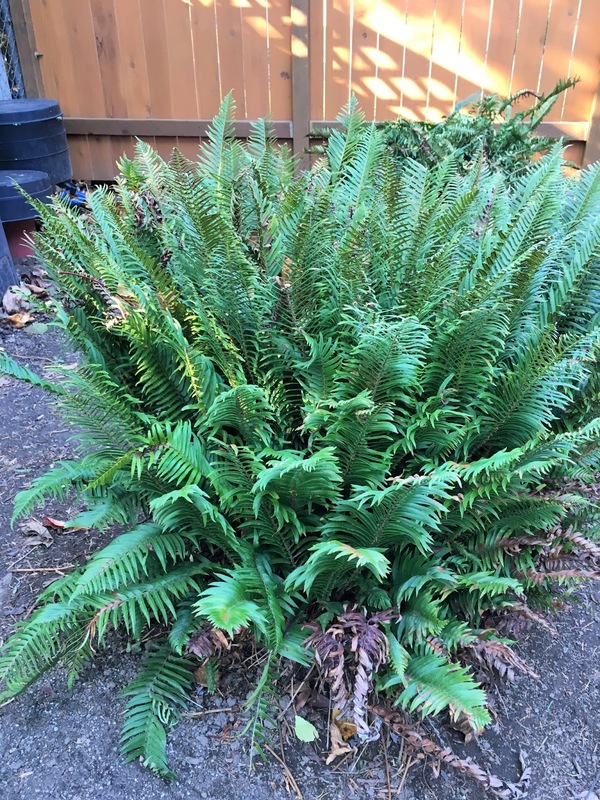 I cleaned them up prior to planting them in their new home next to our new fence on the Northern side of the house. 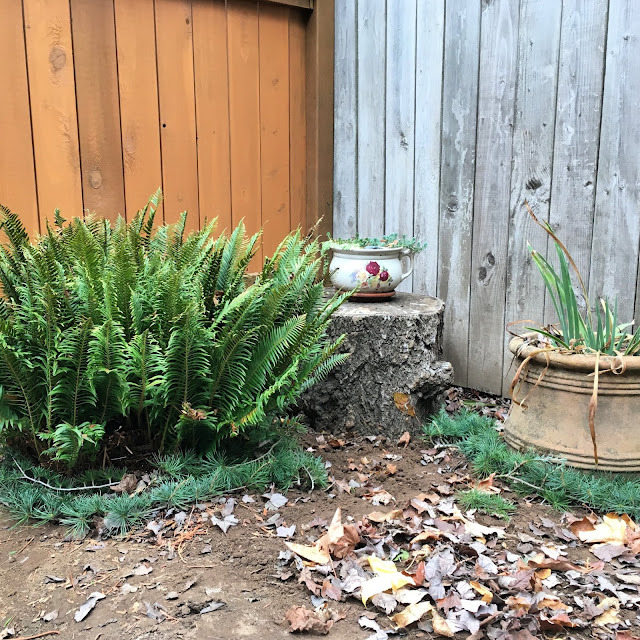 We are slowly incorporating the stumps into the landscape, which serve as nurse logs, but also as a great place to show off a beautiful pot, giving it some elevation from the ground. Two Western sword ferns find a new home on either side of an evergreen huckleberry. 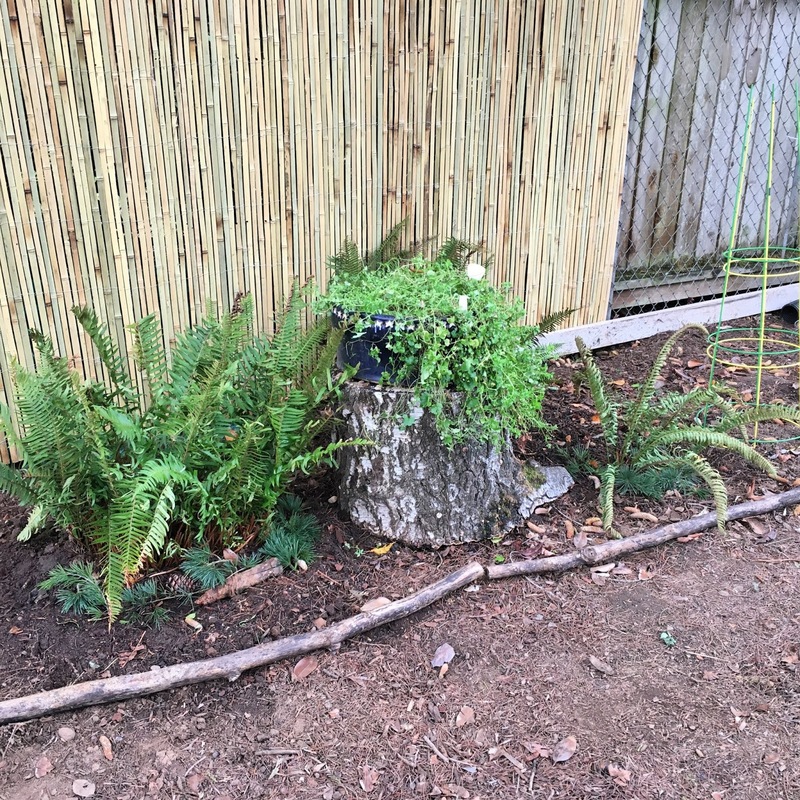 Old birch stump with pot on top filled with succulents. Iris bulbs rescued from a demolition site are in large terracotta pot. One of our cedar trees dropped a big limb during the wind storm, so I used the branch to border a bed, trimming off the evergreen pieces to lay around many of my plants. 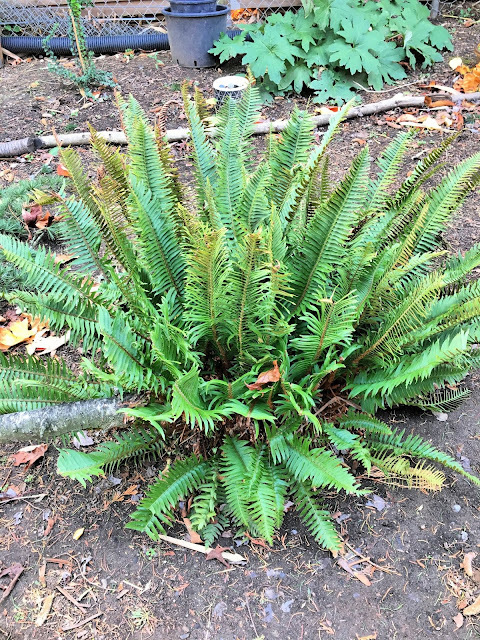 In a way, it's like decorating for the fall/winter season, but also adds many benefits to the garden, one of which is beautification.